For some, waking up means smoking a bowl and eating a bowl of cereal. Now, there’s a way to combine the two, in the form of this genius breakfast bowl. Make no mistake, there’s nothing like smoking a bowl while you eat a bowl – or two – of cereal. The two could be one of America’s great pastimes, just like “Netflix and chill”. Now, thanks to a clever company, there’s a way to combine the two. With the boom of the weed industry, there have been a lot of great innovations (such as delicious edibles and some really clever vapes and bongs). But, like all areas of life, it can be the most simple of things that bring the most pleasure – and the Breakfast Bowl Wake ’n’ Bake Pipe is definitely one of the latter. Like so many things related to weed, such a pipe had been an internet legend, being spoken about but never being able to be purchased. That was until a genius by the name of Ryan Hart decided to make his own and offer it to the rest of the world, all for a cool price of $89. The Breakfast Bowl Pipe was in internet myth that we had to break. We saw all of the photos and followed all the links, but just couldn’t find a place to buy it. So we did the next best thing, we commissioned the production so we could share it with the world. 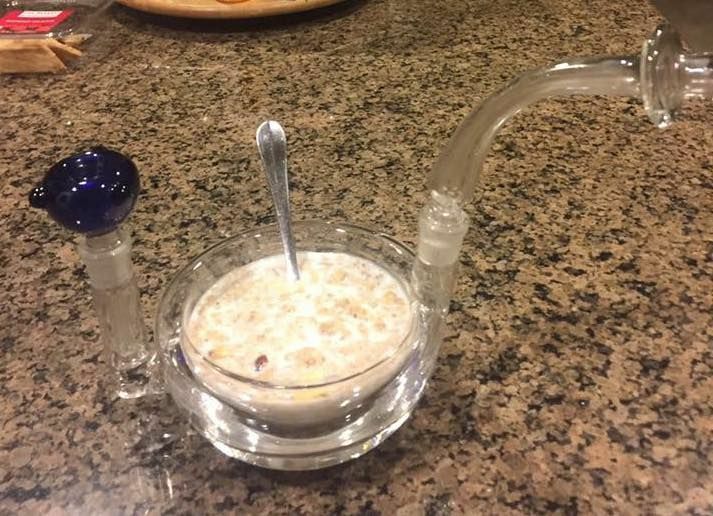 So, is it a breakfast bowl or is it a pipe? Well, it’s really both, but in a clever new design that has the eating bowl with a water pipe built into an inner chamber. Like some of the best pipes, the Breakfast Bowl Pipe is hand-crafted in borosilicate glass. But, unlike others, it has two bowls: one for eating food (that has a decent two-cup volume) and another for your herb. Thanks to this unique design, the Wake ’n’ Bake pipe allows whatever is in the bowl – from Fruit Loops to Lucky Charms – to help with the cooling of the smoke that comes through the inner chamber. Given its design, the smoke is directed through a separate chamber, so it never makes contact with the cereal (or whatever you choose to eat), as you never want the two to mix.